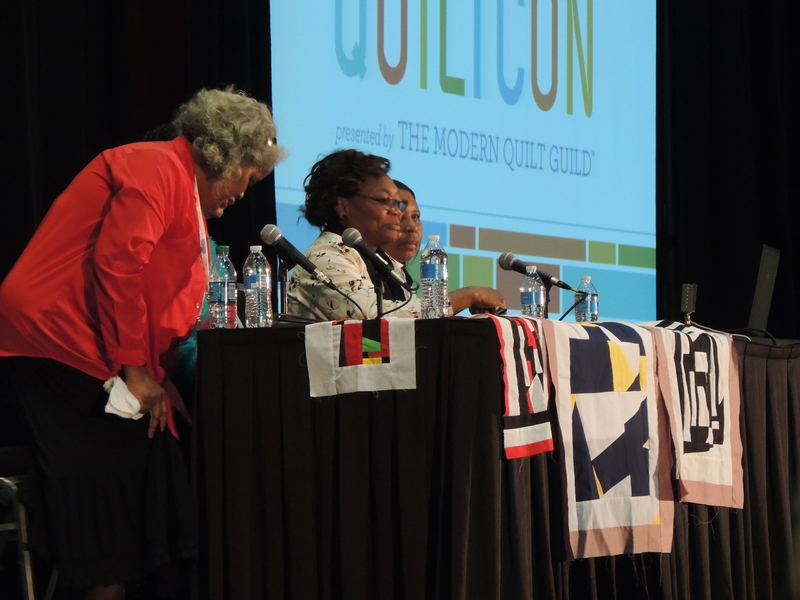 In continuing my discussion about my experience at QuiltCon this year, I have to say that I am so extremely thankful to have gone to the keynote presentation with 4 of the women of the quilters of Gee’s Bend. I did not spend much effort trying to get photographs of the women; I focused on taking notes of their testimonials and videos of their incredible singing. I hope their stories and songs touch you and help you find joy, gratitude, and thanks in your own life. These are just the notes I jotted down as each woman spoke. I hope the power and story behind the words and in the strength of spirit of these women might still translate through in these notes. I am 58. That is what my momma and daddy told me, that is what they put on my birth certificate, I don’t know how old I am. I got 2 whoopin’s from my momma. I found out that was love. Be careful what you ask The Lord for. I asked to get some exercise on this trip. I didn’t know what I was asking for. I saw my momma’s quilt hanging on the wall and it made me cry. I saw fabric from dresses she made for herself. Jeans my daddy wore in the field. Back in the day they did not spank me, my momma did not whoop me, she beat me. Singing while quilting – yes! In closing, below is a video compilation of the gospel songs the women sang at the keynote, preceded by their introduction by Jacquie Gering. They were an inspiration to watch, and so brave for being on that stage in front of an packed lecture hall. I was scared to introduce myself to a person at a time, and they met us all at once with their heads held high and love and gospel on their lips. Thankful Thursday. In this moment I am thankful that I found your blog. You are a rare person, Yvonne. Thank you for sharing your experience. I am just blown away by the women of Gees Bend! I am also thankful that their art (everyday life) is celebrated by so many and that they and their lives, as well as the quilts, are celebrated. Thank you for your kind words, Pam. The women of Gee’s Bend are truly inspirational, and I am so thankful to have had the opportunity to hear them speak and sing! 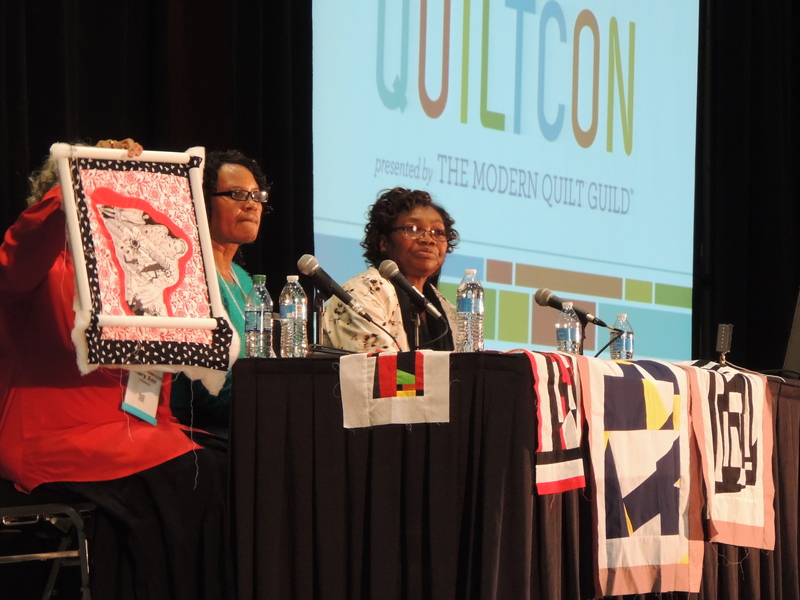 Thanks for all of your posts about Quilt Con. I’ve loved reading them. I especially enjoyed this one today. Thanks for your honesty about the experience and for being willing to share it with us. Thank you so much for that video! Listening to their singing was beautiful, and reading the notes you took was inspirational. Really appreciate it! I am so glad it was inspirational to you as well; I was hoping it would translate through a blog post. Thank you for sharing your notes and the video. Wish I could have been there to see it in person. Very nice to read a little about their stories. It was a lovely experience, and I am so impressed with their ability to be so warm in front of such a large crowd. I would have been shaking in my shoes! What amazing women! I shared your post on my facebook page – such an inspiration! I watched the PBS documentary on the Gee’s Bend Quilters on Wednesday night! It was absolutely awesome, and I totally cried while watching. It must have been a truly awesome experience to see them live. They were absolutely captivating, Audrey. I loved the Q&A portion of the discussion. One woman near me asked if they had seen any of the quilts on display and if the quilts there would inspire them. They all quickly said, “no” and it made us all laugh. Mary Ann tried to soften it a bit, but honesty is definitely their strong suit and I found delight and pleasure in that. Wow! so glad you put this up there to learn more about these amazing people. thank you! You are very welcome, Ruth. And if anyone has better / different / amazing online resources I can link to I would be happy to update the post! “There is no wrong way to make a quilt!” Perfect! Thanks for the inspirational post! Now this has made me properly envious of your trip! I would have loved, loved, loved to have been there for this, and also to see their quilts, more than any of the other wonderful things there. Thanks for giving me a snippet of it here. You are more than welcome, Sally. They were lovely. From the heart, for sure, Nurdan. When I tried to register for this, it was already full. So I didn’t get to attend. So I am particularly grateful that you shared so much detail in your post about it. Thank you so much, I really enjoyed reading this.